All parties involved in the war in Yemen continue to plunge the population into what the United Nations Secretary General has denounced as “the planet’s worst humanitarian crisis.” One estimate put the death toll at nearly 60,000 since 2016. Hostilities between the Saudi Arabia-led Coalition and the Houthi and other armed groups, have become increasingly muddled as loyalties have shifted, armed groups and militia proliferated and factions fragmented. The Coalition includes Bahrain, Egypt, Jordan, Kuwait, Morocco, Saudi Arabia, Sudan, and the United Arab Emirates. It supports the beleaguered Yemen government and its militia. Despite a fragile ceasefire agreed in December, clashes have continued, as have attacks on civilians by Yemeni government militia, the Coalition forces and the armed groups. At the same time, the UN calculated that in 2018 nearly 60% of the aid to alleviate suffering in Yemen came from Saudi Arabia, the UAE and the US. The UK is also now stepping up its aid to Yemen. The UN says about 22 million people out of a population of 29 million need help to secure food this year in Yemen, including nearly 10 million who are just a step away from famine. Nearly 240,000 are facing “catastrophic levels of hunger.” More than 250 humanitarian organisations are operating in the country. The UN Experts Group said that millions of civilians were also suffering “devastating effects” from the coalition’s arbitrary restrictions on shipping and air travel because food, medicines and fuel were needed to fend off starvation and diseases. The Coalition’s screening of ships was supposed to prevent arms smuggling to the armed groups but had become a “de facto blockade’ while the UN searches had found no weapons on ships. The UN Security Council has been slow and one sided. In 2013 the Council had condemned the illicit transfer, destabilizing accumulation and misuse of small arms and light weapons in Yemen, and in April 2015 imposed an arms embargo only targeted on the Houthi armed opposition. Total embargoes had been imposed on UN-designated terrorist groups such as Al-Qaida in the Arabian Peninsula (AQAP) and the Islamic State in Iraq and the Levant (ISIL) affiliate in Yemen, which have become actively engaged in attacks on Coalition as well as armed opposition forces and civilians. In January 2018 the Security Council’s expert panel accused Iran of transferring some missiles and unmanned aerial vehicles used by Houthi forces, although it also reported that there had been no maritime seizures by the UN of weapons and ammunition during 2017, and only very limited seizures of arms-related material had been identified on the main land supply route. However, the Security Council has not imposed an embargo on arms transfers to Yemen as such. The Court to hold public hearings on the question of reparations from Monday 18 to Friday 22 March 2019. As Director of International Law and Policy, I have the privilege of regularly representing the ICRC at the United Nations and other diplomatic events. When I do, the topics and speeches are interesting and at times even inspiring. But the most recent event I attended last week really had a different depth of emotion. We celebrated one hundred ratifications of the Arms Trade Treaty (ATT), welcoming Mozambique as the 100th State Party. Jean-Paul Matuk Munan, directeur exécutif de l’ONG Cri de secours contre la prolifération des armes légères et de petit calibre en Afrique (CRISPAL Afrique), plaide pour la ratification par le Parlement congolais du traité sur le commerce des armes. La Commission défense et sécurité de l’Assemblée nationale a adopté mardi 13 nombre le projet de loi autorisant la ratification de la convention de l’Afrique Centrale pour le contrôle des armes légères et de petit calibre. Le texte va à présent être soumis à la plenière pour débat et vote définitif. La Douane burkinabè bénéficie du 21 au 22 novembre 2018 d’un atelier de formation et de sensibilisation sur le traité sur le commerce des armes (TCA) à Ouagadougou. Venus des différentes contrées du pays, ces douaniers se pencheront sur 4 modules relatifs au TAC sous la houlette d’une expertise française. Le ministre des Forces armées, Dr Augustin Tine a annoncé hier, mardi 11 décembre, que le Sénégal va bientôt adopter une loi visant l’intégration des dispositions du Traité sur le commerce des armes (Tca) dans son ordre juridique interne. Au titre de la réforme des institutions et de la modernisation de l’administration, le Conseil à adopté… [p]our le compte du ministère de la Défense nationale et des anciens combattants : un projet de loi portant mise en œuvre du Traité sur le commerce des armes au Burkina Faso. Ce projet de loi permettra à notre pays de respecter ses obligations internationales découlant du Traité sur le commerce des armes, de règlementer la circulation des armes classiques et la prévention des conflits armés. Le Conseil a marqué son accord pour la transmission dudit projet de loi à l’Assemblée nationale. The First Committee (Disarmament and International Security) on November 6 approved eight draft texts, including ones calling for the universalization of the Arms Trade Treaty and the implementation of the Convention on Cluster Munitions. Concluding its programme of work, the First Committee (Disarmament and International Security) on November 8 approved 27 draft resolutions and decisions, including two separate proposals to create working groups within the disarmament machinery to develop rules for States on responsible behaviour in cyberspace. The Security Council has increasingly addressed weapons and ammunition management in recent decades. The use of arms- and ammunition-related language in UN Security Council (UNSC) resolutions has evolved rapidly and the scope has broadened significantly. Conveniently clustering past Security Council action regarding weapons and ammunition management, and suggesting further options, this Aide-Memoire seeks to assist particularly those Member States serving on the Security Council, in accurately and comprehensively reflecting state-of-the-art practices into relevant drafts of the Council’s decisions. The Algerian National Army has acquired 120 mm SM4 self-propelled mortars made by the Chinese company Norinco. President Muhammadu Buhari has said the fall of Muamar Gadaffi of Libya led to arms proliferation in Nigeria and worsened banditry, insurgency as well as farmers/herders clashes across the country. The president made the statement today in an interview aired on Arise TV while responding to questions on killings going on in Zamfara State. Panic could be subsiding in The Gambia stemming from a suspicious arms shipment impounded at the tiny country’s seaport last week, but police investigations continue, sources told ADV on Sunday. The GACH Security Ltd. situated at Fatou’s Gold Plaza, Bertil Harding Highway, Kanifing, has applied for Gun Importation Licence in accordance with the Arms and Ammunitions Act to enable them import single barrel rifles for hunting and recreational purposes in The Gambia, according to Office of the Inspector General of Police. An international arms trader, in relentless pursuit of alleged unpaid commission going back to the 1980s, now wants the Auditor General of South Africa to release apartheid-era records to boost his civil claim against the state arms procurement agency in Portugal. The Auditor General of South Africa faces a High Court application to produce records relating to Armscor’s controversial acquisition of 50 Puma helicopters from a French armaments company more than 30 years ago. The Volta Regional Police Command has denied media reports attributed to the Regional Commander, DCOP Francis Ebenezer Doku suggesting Alavanyo has become a base for the manufacturing of assault weapons. According to earlier publications, DCOP Francis Doku who was briefing journalists on the recent shootout between youth in Alavanyo Dzogbedze and security officials, said weapons being used to commit crime in the area were not only imported into the area but also produced there. The chief executive of Armaments Corporation of South Africa (Armscor), Kevin Wakeford, on Monday took special leave following revelations that implicated him in the Bosasa corruption at the state capture commission of inquiry. Wakeford has allegedly been implicated in the affidavit to the commission by whistleblower and former Bosasa chief executive, Angelo Agrizzi. Côte d’Ivoire has signed for a single Airbus Defence and Space C295 tactical transport aircraft, the manufacturer announced on 21 January. High expectations attract principal providers of defence equipment to Ivory Coast trade show. Africa’s arms market is likely to grow by 50% over the next five years, analyst Stephane Konan said at a four-day trade show in Ivory Coast. Consequent upon intelligence indicating the presence of huge quantity of arms in unlawful possession of some Nigerians, the desperation of some citizens to acquire more arms, and the continued proliferation of illicit weapons in the polity, with the attendant negative and security implications, the Inspector General of Police, Ag IGP Mohammed A. Adamu NPM, mni , has called on all Nigerians currently in unlawful possession of such weapons to immediately ensure a voluntary return of the weapons to Police Station or Public Armoury nearest to them. The chief executive of Armaments Corporation of South Africa (Armscor), Kevin Wakeford, on Monday slammed allegations by former Bosasa COO Angelo Agrizzi at the state capture inquiry as “malicious, a gross fabrication and the fabric of lies”. The Acting Inspector-General of Police, Mohammed Adamu, has ordered the seizure of illegal firearms in the country. He also suspended the issuance of new firearm licences throughout the country. The Nigerian Army appears to have set up a production line for its indigenously developed light off-road vehicle. Nigerian Army Vehicles Manufacturing Company (NAVMC) was formally commissioned by Chief of the Army Staff Lieutenant General Tukur Buratai on 26 January. Vingt-quatre heures après avoir été paraphé à Khartoum, l’accord de paix et de réconciliation en République centrafricaine a été signé par le gouvernement centrafricain et les 14 groupes armés reconnus, mercredi au Palais de la Renaissance, à Bangui. Les représentants de 11 groupes ont signé le texte (trois autres dont le FPRC et l’UPC l’avaient déjà fait) suivis du président centrafricain, Faustin Archange Touadéra. As accusations of human rights violations pile up in Cameroon’s two-front battle against secessionists and Islamist extremists, the United States has decided to scale back its military assistance to its longtime ally in Central Africa. What is the difference between PDP and APC? Many would say, they are the same, which is not true. Looking at how both parties manage themselves and how they handle the business of governments when they win elections, here are some findings. Are you not worried about the number of illegal arms and dangerous weapons in circulation? We are worried about this. There are indeed so many illegal arms in Nigeria . Some arms were imported by politicians including some governors. They have also procured vehicles with different security apparatus which they plan to use to intimidate people during the elections. South Africa’s Paramount Group (Stand 12-C15) is launching a brand-new variant of its Mbombe 4 (4×4) mine-resistant armoured vehicle here at IDEX. Il a été procédé aujourd’hui lundi 29 Octobre 2018, à la livraison de (855) véhicules polyvalents et tout-terrain de différents types (transport de personnels, transport d’écoliers, ambulances médicalisées et sanitaires) de marque Mercedes-Benz Classe G (4×4) et Sprinter, fabriqués par la société pionnière dans le domaine, la «SPA SAFAV» Société Algérienne de Fabrication des Véhicules à Bouchakif/Tiaret/2e RM, et ce, au profit de la Direction Centrale du Matériel relevant du Ministère la Défense Nationale, ainsi qu’au profit du Ministère de l’Intérieur, des Collectivités Locales et de l’Aménagement du Territoire, de la Direction Générale de la Sureté Nationale, de la SONATRACH et à des instances publics et privés. Equatorial Guinea has received two new Mil Mi-17 ‘Hip’ transport helicopters from Russia, one of which has been delivered in a VIP configuration with the other being in a standard passenger configuration. Former Director General of state-owned Metals and Engineering Corporation (METEC), Major General Kinfe Dagnew, was arrested, according to FBC report. According to the report, citing Ethiopian Attorney General Berhanu Tsegaye, General Kinfe Dagnew was arrested as he was trying to flee to Sudan via Humera in Tigray regional state. The attorney general has also stated that additional 27 former army officers, their business associates and brokers allegedly involved in illicit financial out of the country by abusing their duties and responsibilities and corruptly running a military enterprise know as Metal Engineering Technology Corporation (METEC). Ethiopia’s Metal & Engineering Corporation (MetEC) has been the subject of an investigation into allegation of corrupt conduct and embezzlement of public funds. Another report alludes it might also have been engaged in an illicit arms trade, in a blatant breach of international law. METEC is Ethiopia’s largest company — a sprawling military-run industrial conglomerate that has for years wielded significant influence in the economy and drawn suspicion from some that it is a vehicle for patronage by governing elites. A convoluted legal battle is taking place over the Port of Doraleh in Djibouti. The country has illegally seized control of the port from operator DP World and reneged on its contract. And now a special report on the arms trade in the Horn of Africa has warned that the port could potentially be used as an illegal weapons hub. Elliot Gardner untangles the story behind the fight for control over the disputed port. A sale of state-owned arms manufacturer Denel to Saudi Arabia is no longer on and the company, which recorded a loss of nearly R2bn in the past financial year, is strong enough to stand on its own, chair Monhla Hlahla said. Un projet conjoint d’appui à la mise en œuvre de la Convention de l’Afrique centrale pour le contrôle des armes légères et de petit calibre [ALPC], de leurs munitions et de toutes pièces et composantes pouvant servir à leur fabrication, réparation et assemblage, dite Convention de Kinshasa, a été lancé vendredi 7 décembre à N’Djamena, capitale du Tchad. En dépit des avancées importantes obtenues dans la mise en œuvre du projet, en complémentarité avec d’autres initiatives mises en œuvre par le PNUD dans la région, les défis restent énormes, a estimé le secrétaire général du ministère de la Sécurité et de la Protection civile, Aser Kamaté. Dans le cadre de la lutte contre la fabrication et le trafic illicites des armes à feu, un atelier de formation pratique spécialisé sur les investigations et poursuites pénales des a regroupé plusieurs acteurs du secteur. C’est le 3 décembre dernier, à l’Hôtel Azalai Salam de Bamako. On 11 December, French Defense Minister Florence Parly oversaw the handover at a ceremony at M’Polo military base in the capital Bangui. France donated over 1,400 AK-47 assault rifles and three amphibious vehicles (no model specified) to the Central African Republic. The 1,400 AKs are a gift: they were seized aboard a dhow off Somalia in 2016 that was intercepted for breaching an arms embargo with Yemen. Today, the U.S. Department of the Treasury’s Office of Foreign Assets Control (OFAC) imposed sanctions on three individuals pursuant to Executive Order (E.O) 13664: Israel Ziv and Obac William Olawo, for being leaders of entities whose actions have the purpose or effect of expanding or extending the conflict in South Sudan, and Gregory Vasili, for actions that have undermined peace, stability, and security in South Sudan. Additionally, OFAC designated six entities for being owned or controlled by two of the aforementioned individuals. The behavior of each designated person stands in direct opposition to significant U.S. efforts to help those affected by the conflict in South Sudan and establish a lasting peaceful resolution to the current conflict. Chinese-made CS/SH1 122mm 6×6 self-propelled howitzer is now in service with the Rwandan armed forces. December 11, 2018, a picture was released on the Flickr account of Rwanda President Paul Kagame press services showing the CS/SH1 122mm howitzer used by the Rwandan armed forces during a live firing military exercise held at the Gabiro Combat Training Centre in northeast Rwanda. The government of South Sudan has denied purchasing weapons from retired IDF Maj. Gen. Israel Ziv, saying the US decision to impose sanctions against him and two others was based on false information. L’Armée nationale populaire mène une guerre sans merci contre les trafiquants d’armes. Un phénomène qui a pris de l’ampleur depuis 2011, soit depuis la guerre survenue en Libye. There was widespread anger in Libya this week after al-Khoms port authorities east of the capital Tripoli seized a container laden with weapons and ammunition coming from Turkey. The authorities in the port said this was the second such seizure in al-Khoms this year. They said the cargo included 3,000 handguns, 400 hunting rifles in addition to 2.3 million bullets. Le maréchal Khalifa Haftar, commandant de l’Armée nationale libyenne (ANL), a appelé l’ONU à diligenter une «enquête immédiate» pour faire la lumière sur le trafic d’armes entre la Turquie et la Libye. Cette demande intervient au lendemain de l’annonce par les services des douanes à Tripoli de la saisie de deux conteneurs d’armes dans le port d’Al-Khoms. Ces armes se trouvaient à bord de deux containers. «Ces deux containers originaires de Turquie contenaient des milliers de pistolets, des fusils et plus de 4,2 millions de balles, soit assez pour tuer environ 80% de la population libyenne», a alerté Khalifa Haftar. Il a été procédé, ce dimanche 23 décembre 2018 à Rouiba/1eRM, à la livraison, sous l’égide de la Direction des Fabrications Militaires, de (356) camions multifonctions de marque Mercedes-Benz, dont (215) camions au profit de la Direction Centrale du Matériel au Ministère de la Défense Nationale, destinés au transport des troupes, dépannage léger, citernes d’eau, et des camions poste de commandement, ainsi que (141) véhicules pour la Direction Générale de la Sûreté Nationale et des entreprises économiques civiles publiques et privées, fabriqués par la Société Algérienne de Production de Poids Lourds de marque Mercedes-Benz à Rouiba/1eRM, issue d’un partenariat Algéro-Emirati-allemand. The Qatari armed forces have supplied Mali with 24 4×4 Storm light 4×4 APC Armored Personnel Carrier vehicles to fight terrorism and establish security not only in the Republic of Mali but also in the African Sahel countries known as the G5. Il a été procédé aujourd’hui, dimanche 30 décembre 2018, à la livraison de (645) véhicules multifonctions et tout-terrain, dans différentes versions (transport de troupes, véhicules pour patrouille ,d’intervention, fourgons tôlés, transport d’écoliers et ambulances médicalisées et sanitaires) de marque “Mercedes-Benz” Classe G et Sprinter, fabriqués par la Société Algérienne de Fabrication des Véhicules à Bouchakif/Tiaret/2e RM, et ce, au profit de la Direction Centrale du Matériel relevant du Ministère la Défense Nationale, le Ministère de l’Intérieur et des Collectivités Locales et de l’Aménagement du Territoire, la Direction Générale de la Sûreté Nationale, la Direction Générale de la Protection Civile et d’autres structures nationales privées. High ranking members of the Colombian National Police found themselves in Exeter, N.H., in the spring of 2009. They were there to visit arms maker Sig Sauer, which had just secured a contract worth up to $306 million to provide Colombian law enforcement with nearly 100,000 pistols. A decade later, that arms deal is at the center of a court case in Germany, where Sig Sauer’s New Hampshire-based CEO faces charges that he conspired to mislead German officials about the nature of the sale. La saga de l’affaire des armes de Saint-Marc, dans laquelle est mis en cause l’ex-coordonnateur de l’Unité centrale de sécurité du Palais national d’Haïti (UCSPN) Vladimir Paraison, inculpé dans le dossier de l’importation illégale d’armes et de munitions d’Orlando, Floride, à Saint- Marc, Haïti, avec une série d’autres personnes, y compris l’ancien directeur général de la Police nationale d’Haïti Godson Aurélus, prend un nouveau tournant. A week after an Orlando gun shop owner was informed that that his request to export semi-automatic weapons, ammunition and ballistic armor to Haiti had been denied by U.S.. government officials, the federally licensed arms dealer fired off an email to a Pompano Beach ballistic armor company and requested personal protection gear on behalf of Haitian police. U.S.-sourced guns brutalize and force migrants to flee all along the route between Central America and the United States. In Honduras, El Salvador and Guatemala, U.S.-sourced guns in the hands of both gangs and state forces are making life untenable in neighborhoods, and communities, forcing families to flee. Upon reaching Mexico, police armed with weapons imported from the United States, urged by Washington to stop the flow of refugees, have detained and deported hundreds of thousands of such migrants. A key US congressman has asked whether Congress should consider adding restrictions on weapons sales to the Saudi-UAE coalition in Yemen after a recent investigation said that US-made weapons had been transferred to al-Qaeda-linked groups in the country. Eliot Engel, the chairman of the House of Representatives Foreign Affairs Committee, said on Wednesday that he was troubled by reports over illicit weapons transfers to armed groups. An air cargo shipper and its client on Friday both denied knowledge of the small shipment of weapons that Venezuelan authorities said arrived in the city of Valencia earlier this week on a flight from Miami International Airport. A Boeing 767 operated by 21 Air, which maintains an operating facility at MIA, delivered cargo earlier this week that included 19 assault rifles, telescopic sights, radio antenna and other materiel to the international airport in Valencia, according to a Bolivarian National Guard general, Endes Palencia. Asserting congressional authority over war-making powers, the US House of Representatives approved a resolution Wednesday that would force the Trump administration to withdraw US troops from involvement in Yemen, in a rebuke of Donald Trump’s alliance with the Saudi-led coalition behind the military intervention. Lawmakers in both parties are increasingly uneasy over the humanitarian crisis in Yemen and are skeptical of the US partnership with that coalition, especially in light of Saudi Arabia’s role in the killing of Jamal Khashoggi, a critic of the royal family. Si Godson Orélus, l’ex-chef de la Police nationale d’Haïti incarcéré à la prison de Saint-Marc, sous l’accusation d’implication présumée dans la contrebande d’armes et d’association de malfaiteurs, suite à une décision du juge instructeur Dieunel Lumérant, ne connaît pas les tournants et aboutissants de cette vaste conspiration dans laquelle les autorités du pays jouent un rôle central, il va sans dire qu’il aura la surprise de sa vie. Car on aura fait de lui “le dindon de la farce”. The increased delays appear to have begun after news reports in 2016 that suggested Canadian-made LAVs were used by a Saudi-led coalition against Houthi rebels in Yemen. Michel Martelly et Laurent Lamothe et leurs alliés du PHTK, qui croyaient avoir eu la partie belle pour importer des armes illégalement, à des fins non encore connues, sont en passe d’apprendre que leurs activités étaient suivies de près par les autorités américaines. The Saudi government’s murder of journalist Jamal Khashoggi has led to increased condemnation of the regime’s human rights abuses, including its devastating war in Yemen. With the war finally making headlines after three years, it is worth scrutinizing the involvement of James Crown, one of the most influential trustees of the University of Chicago. La résidence du juge d’instruction Dieunel Lumérant a été attaquée par des individus lourdement armés dans la nuit du 29 au 30 novembre 2018. Le magistrat Lumérant mène l’enquête sur la cargaison d’armes à feu saisie dans le parking de la douane de Saint-Marc en 2016. Le sénateur de l’Artibonite Youri Latortue a rendu, ce lundi 3 décembre 2018, une visite de courtoisie au juge Dieunel Lumérant en son cabinet au tribunal de première instance de Saint-Marc. Selon le président de la Commission Ethique et Anticorruption du Sénat de la République, cette visite est l’expression d’un support moral au magistrat instructeur dont la maison a été trouée de balles dans la nuit du 29 au 30 novembre dernier. L’affaire de contrebande d’armes et de munitions de Miami, Florida, vers le port de Saint-Marc, Haïti, en septembre 2016, avance. Sous fortes pressions de la justice américaine voulant identi- fier les vrais responsables de ce réseau de contrebandiers le juge instructeur a rendu sa décision. Me Leumrant, le juge instructeur de Saint-Marc, a rendu son ordonnance définitive. Plusieurs responsables de la Police nationale, dont l’ex-directeur général, Godson Orélus, se trouve en prison, depuis bientôt deux mois. La majorité des inculpés sont présentement recherchés par la police et considérés, désormais, comme des fugitifs. The $15 billion arms deal with Saudi Arabia and General Dynamics Land Systems – a London, Ontario, based arm of the U.S. defense and aerospace contractor – has been an elephant in the room as the human rights stand-off between Canada and Saudi Arabia continues. Prime Minister Justin Trudeau’s government has voiced its support for the arms deal which was signed in 2014 under former Prime Minister Stephen Harper. The Russian father and son were in a Hungarian jail, charged in an elaborate plot to ship weapons to Mexican drug cartels and cocaine to the U.S. They found an American lawyer anticipating an inevitable extradition and trial in New York. But then the case took an unexpected turn. El Resuelto N° 118/DIASP/UASL/18 mediante el cual, se extiende por nueve meses la veda de importación de armas de fuego, fue promulgada en Gaceta Oficial. L’ex coordonnateur de l’Unité centrale de sécurité du Palais national d’Haïti (UCSPN) s’est dérobé au mandat d’amener qui a été décerné contre lui par le juge d’instruction de Saint Marc, dans le cadre de l’affaire de la contrebande d’armes et de munition en provenance de Miami, Floride. As Haiti’s national police struggled to regain control of Port-au-Prince last month after days of government paralysis following a violent anti-government protest, guards at a security checkpoint noticed a suspicious-looking White Nissan Patrol. On the surface, Noor Noor and Terry Burns don’t have much in common. The former is a 28-year-old student at Cambridge, getting a degree in environmental conservation that he plans to use back home in Cairo, Egypt. The latter sells lawn ornaments and homegrown vegetables out of her house in the rolling farmlands of Jamestown, Pennsylvania, population 617. They’ve never met. But Noor and Burns are linked by the global trade in nonlethal weapons, a growing industry that burst into the headlines when asylum-seekers were tear gassed as they tried to cross the US-Mexico border. La Fiscalía contra el Crimen Organizado imputó cargos por el delito de tráfico de armas y falsedad ideológica a Ovidio Fuentes, exdirector de la Dirección Institucional de Asuntos de Seguridad Pública (Diasp) del Ministerio de Seguridad. It’s an eye-catching statistic in an otherwise routine data dump. Through the first ten months of 2018, sales of New Hampshire-made weapons to Saudi Arabia soared. According to export data released by the U.S. Census Bureau and first reported by the New Hampshire Business Review, more than $61 million worth of firearms and accessories have been shipped by a New Hampshire company to Saudi Arabia this year, compared to less than $200,000 in 2017. The United States said on Wednesday it has approved the sale of $3.5bn in missiles to Turkey, in an overture to Ankara following US outrage over the NATO ally’s plans to buy weapons from Russia. Saudi Arabia has fallen behind in making payments on its $15-billion arms deal with Canada, a contract that Prime Minister Justin Trudeau has said he’s looking for ways to halt. The Saudi government was short $1.8 billion in payments to the end of September for light-armoured vehicles assembled at General Dynamics Land Systems Canada (GDLS) in London, according to financial statements from the Canadian Commercial Corp., the federal Crown corporation overseeing the controversial contract. Most weapons the covert groups use are made in Russia and Venezuela, and were part of the Nicaraguan Army and Police arsenal. Nicaragua’s atmosphere has been tense since April 2018. What started as a protest against social security reforms led to a conflict that has continued for months, with a death toll of 264, according to a July 2018 report from the Inter-American Commission on Human Rights. Repression against protesters is constant, and involves the police force of Daniel Ortega’s government and paramilitary groups, known in the Central American country as Sandinista mobs. At a recent gathering at the Army Navy Country Club in Arlington, two of the Pentagon’s highest-ranking weapons-buyers sent a clear message to a packed room of defense executives. America is racing Russia and China to develop a worldwide hypersonic strike weapon that can reach anywhere in the world within hours, they said, and it’s time for American defense contractors to move from science and research to full-scale production of those systems. El Juzgado Séptimo de Primera Instancia Penal condenó a siete implicados en el Caso Negocios de la Industria Militar que aceptaron haber pagado comisiones ilegales para beneficiarse con adjudicaciones en esa entidad. The first Russian-made T-90S main battle tanks (MBTs) ordered by Vietnam in 2016 have arrived in the Southeast Asian country, and are expected to be delivered to the army in the next few days, a Vietnamese military source told Jane’s on 2 January. Korea Aerospace Industries, South Korea’s sole aircraft manufacturer, has apparently failed in its bid to export its Surion choppers to the Philippines, an official at Seoul’s arms procurement agency said Saturday. Austrian small arms manufacturer Steyr is to develop two maintenance centres in the Sultanate of Oman, the head of the Oman Partnership for Development (OAPFD) offset agency has disclosed. Satellite imagery suggests Saudi Arabia has built a solid-propellant rocket motor production facility next to its Al-Watah missile base, the Washington Post cited experts as saying on 24 January. The Indonesian Ministry of Defence (MoD) has said it is preparing a defence co-operation agreement with Belarus that will facilitate joint research, development, and manufacturing activities. India’s prime minister faces charges of bypassing procedures, causing loss in public funds, compromising national security and using the arms deal to offer a lucrative contract to an ally. Corruption in India is pervasive, omnipresent and multifarious, especially in the nexus between politics and business. As India heads toward its general election, expected to be held in April and May, Prime Minister Narendra Modi finds himself embroiled in controversy around one of the country’s largest arms purchase contracts: a murky 7.8 billion euro weapons deal to purchase 36 Rafale fighter planes from France. A new law regulating the brokering of arms is set to prevent weapons from ending up in the wrong hands or illicit brokers moving their activities to New Zealand. The wholesale re-armament of Qatar in the midst of growing regional tensions caused a dramatic shift in the global defence trade market, according to the 2018 Global Defence Trade Report, released today by Jane’s by IHS Markit, the global business information provider (Nasdaq: INFO). The annual report highlights a 3.8 percent compound annual growth rate in total exports since 2009 across 2018. A Labour MP’s grotesque take on Yemen war casualties serves only to show the sordid and politicised nature of body counts. Counting the bodies in conflicts is a necessary, confusing and too often sordid business. Body counts are necessary for obvious reasons. Numbers supply a moral reference point. They tell us about the scale of a conflict as well as if civilians were targeted and how. They provide evidence for different kinds of human rights advocacy in an international setting, and assist in setting policy for emergency assistance. Where counting the bodies becomes sordid, however, is when the process becomes political and weaponised for a purpose; that is, when it is in hock to competing agendas. Indonesia and Russia have vowed to strengthen defence ties to support procurement and military-technical co-operation, according to official statements by the two governments on 7 February. A UAE-based small arms maker has emerged as the finalist in another fast-track procurement, for 94,000 carbines (a compact rifle firing smaller bullets). The Sindh police plan to acquire a consignment of over 6,000 9mm pistols for Karachi amid growing security challenges which warrant use of effective and easy-to-handle arms in urban policing against organised criminal and militant gangs, it emerged on Sunday. Three major news stories of recent weeks highlight the folly and shortsightedness of the federal government’s plan, announced earlier this year, for Australia to become a top 10 global arms dealer. The revelation that the attorney general blacked out findings that the Australian taxpayer was overcharged hundreds of millions of dollars for its fleet of armored vehicles, the assassination of Jamal Khashoggi, and subsequent refusal or equivocation by arms exporting states over freezing sales to Saudi Arabia, and the UN assessment that the famine resulting from the ongoing war in Yemen (the end use destination of many of these arms) is on track to become the worst in living memory, all contain dire warnings for our government. Diehl Defence has consolidated its successful co-operation with the Royal Thai Air Force with another contract for the supply of IRIS-T (InfraRed Imaging System – Tail/Thrust Vector Controlled) short-range air-to-air missiles. Vietnam’s defence industry has unveiled a range of products at the Indo Defence 2018 exhibition in Jakarta as part of a government target to expand international military sales and collaboration, Major General Doan Hung Minh, the vice-chairman of the Vietnam Ministry of Defence’s (MoD’s) General Department for the Defence Industry has told Jane’s . Defence has quietly off-loaded disused Australian-made artillery on the global arms market, selling 92 cannons to a global weapons manufacturer that reportedly spruiked them as being of interest to Middle Eastern or Latin American armies. The highly mobile Hamel light field artillery guns, which can fire a 105mm high-explosive shell nearly 20km, had been built in Victoria in the 1990s under ­licence from the gun’s manufacturer BAE Systems for use by the Australian Army. Saudi Arabia has sought to lower its dependence on arms imports by building up its own defense industry, a process still in its infancy. Saudi Arabia has also considered diversifying the sources of its arms and has looked to suppliers in countries such as Russia and China. In addition to promoting its artillery systems, such as the CAESAR 155mm/52 calibre system in service with the Indonesian Army, Nexter is promoting its combat-proven VBCI (8×8) in the region. Local Indonesian company Rajawali Lintas Kreasi is showing two of the more recent Russian military trucks it is marketing in Indonesia. These are the GAZ Sadko Next (4×4) and the Ural 432007-31 (6×6). The K9 Thunder 155mm/52 calibre self-propelled (SP) artillery system of South Korea’s Hanwha Land Systems will continue in production until at least 2021 and the company is now seeking additional export contracts to keep the production line running after this date. Oman has been revealed as the potential customer for the desert-optimised K2 main battle tank that Hyundai Rotem displayed during the DX Korea exhibition held in Seoul in September. Norway has become the latest nation to enforce restrictions on sales of defence-related technology to Saudi Arabia in response to the current controversies surrounding the Middle Eastern country, including its involvement in the conflict with neighbouring Yemen. Two army jawans, storekeeper of the Central Ordinance Depot (COD), Jabalpur, a retired armourer, a Bihar police constable, two Bihar government school teachers and at least a dozen arms smugglers and middlemen are among the 35 people who have been arrested since August 29 after Bihar police exposed one of India’s biggest smuggling racket of the gas operated, Russian made AK 47 assault rifles meant for use only by armed forces. Ashok Leyland, the largest supplier of wheeled military vehicles to the Indian army, will provide high mobility vehicles for mounting Elbit’s howitzers. On December 18, 2018, the National Day parade of Qatar’s armed forces took place in Doha, the capital of Qatar. ” During this military parade, Qatar armed forces showed new combat equipment as the German KF41 Lynx IFV and Ukrainian Stugna anti-tank missile mounted on Turkish Ejder Yalcin 4×4 armored. As presumed after the Tank Biathlon competition held in 2018, the sale of T-72B MBTs tor Laos was signed, as previously announced by Defense Studies. In early April this year, the Russians introduced the T-72B upgrade of the T-72 tank to Lao military officials, namely, Laotian Defence Minister Lieutenant General Sengnuan Xayalat, and demonstrated the tactical features of the upgraded T-72B. Laos consequently ordered “several dozen” T-72B MBTs to modernize its army. The Lao People`s Armed Forces (LPAF) receive a new self-propelled howitzer (SPH) armed with the Soviet-/Russian-made D-30A 122 mm howitzer on the chassis of the Ural-4320 6×6 all-terrain truck, the press department of the LPAF said. Along the lone street that runs across the village of Darra Adamkhel, there are shops that display firearms. Shotguns, revolvers, automatic pistols, snipers and even Kalashnikovs are carefully wrapped and preserved in plastic covers; more lethal weapons like rocket launchers and such can be found in the basement. Darra’s economy is driven by only one business – the manufacture and sale of illegal arms. According to the Centre for Analysis of World Arms Trade’s report, Qatar has displayed what appear to be newly acquired AK-12 assault rifles in a parade to mark the country’s National Day on 18 December. “Qatar Joint Special Forces (QJSF) armed with new Kalashnikov AK-12 assault rifles chambered for 5.45×39 mm,” – said Russian independent research, information and publishing center. It is not the first time UK trade policy has been criticised for putting deals ahead of human rights. The British government pursued arms deals with Saudi Arabia in the weeks after the killing of journalist Jamal Khashoggi, even as it publicly condemned the murder. More than half a billion pounds of council workers’ pension money has been directly invested by local authorities in arms companies implicated in Saudi Arabia’s military campaign in Yemen, in which thousands of civilians have been killed. Foreign secretary Jeremy Hunt has been accused of misleading parliament about UK weapons sales to repressive regimes, amid growing pressure on the government over the lucrative trade. Mr Hunt has defended the lucrative trade, and the sale of UK weapons generally, telling parliament in October that restrictions on selling to repressive governments had been “strengthened under the Conservative-led coalition in 2014”. Panzerhersteller Rheinmetall AG tut sich mit BAE Systems Plc zusammen, um sich auf den erwarteten Auftrag der britischen Armee für den Radpanzer Boxer vorzubereiten. Europe is experiencing an increase in investment in land capabilities after more than a decade of limited spending in this area. A number of EU member states have indicated interest and planned investments in acquisition and modernisation of armoured vehicles. This study was carried out in support of the European Defence Agency’s work to identify potential areas of collaboration for its participating Member States and partner countries, thus developing European defence capabilities and promoting armaments cooperation. The study examined the current armoured vehicle demand and supply landscape. As a result of the analysis, researchers identified five potential collaboration opportunities and analysed the potential related costs and benefits of each. An arms company which received a controversial handout of public money has been given free management advice by the Scottish Government’s business agency, we can reveal. Scottish Enterprise has provided “account management” services to Raytheon at no cost to the Fife-based firm for more than a decade. Lydia Noon reflects on a busy week for those seeking and profiteering from arms deals, and the hypocrisy of it. [A]s the Brexit engine rumbles on, so does one of the most controversial and disturbing aspects of it: the dealings of the UK’s weapons industry with unscrupulous regimes. The Belgian company CMI (Cockerill Mechanical Industries), based in Seraing near Liège, signed on Monday 28 January an agreement with Saudi Arabia to create a joint venture specialized in tank and wheeled armored vehicle turrets, reports the Belgian newspaper L’Echo on Wednesday, January 30. The goal is to design and manufacture military equipment on site. The neutrality of the chief gatekeeper to the UK’s arms control regime has been brought into question after he repeatedly attacked the integrity of British NGOs’ claims about civilian deaths in Yemen. Graham Jones, a Labour MP and chair of the Commons committees on arms export controls (CAEC), also said that blame for the war in Yemen lay primarily with Iran, and not the west or Saudi Arabia. Now in its fifth year of war against Russian-backed militants, the Ukrainian military has gained long-awaited approval to purchase and import new gear and weapons for its soldiers, free from the oversight of third-party state mediators. A new bill signed into law by President Petro Poroshenko on Jan. 31 removed the exclusive rights of UkrOboronProm – a state-run defense production monopoly – to control and regulate all foreign arms deals in the country and skim the cream off of the top of such deals. The new legislation has resurrected hopes for deals to be struck with the United States on an array of modern, high-tech weaponry that Ukraine says it needs to defend itself. A Commons committee is scrutinising UK arms export controls – yet the Yemen conflict isn’t even on the agenda. Seated in front of a tapestry embroidered with words from the lexicon of “British values” – freedom, equality, tolerance, liberty – ten MPs spent an hour last week taking evidence from NGOs on an issue that calls these values into question: UK arms export policy. This is the Parliamentary committees on arms export controls (CAEC) in action: a body responsible for scrutinising government policy and holding it to account. The UK is on “the wrong side of the law” by sanctioning arms exports to Saudi Arabia for the war in Yemen and should suspend some of the export licences, an all-party Lords committee has said. The report by the international relations select committee says ministers are not making independent checks to see if arms supplied by the UK are being used in breach of the law, but is instead relying on inadequate investigations by the Saudis, its allies in the war. The International Relations Committee believes that the Government is narrowly on the wrong side of international humanitarian law on arm sales to Saudi Arabia given the volume and type of arms being exported to the Saudi-led coalition, they are highly likely to be the cause of significant civilian casualties in Yemen. The report expresses deep concern that the Saudi-led coalition’s misuse of their weaponry is causing—whether deliberately or accidentally—loss of civilian life. 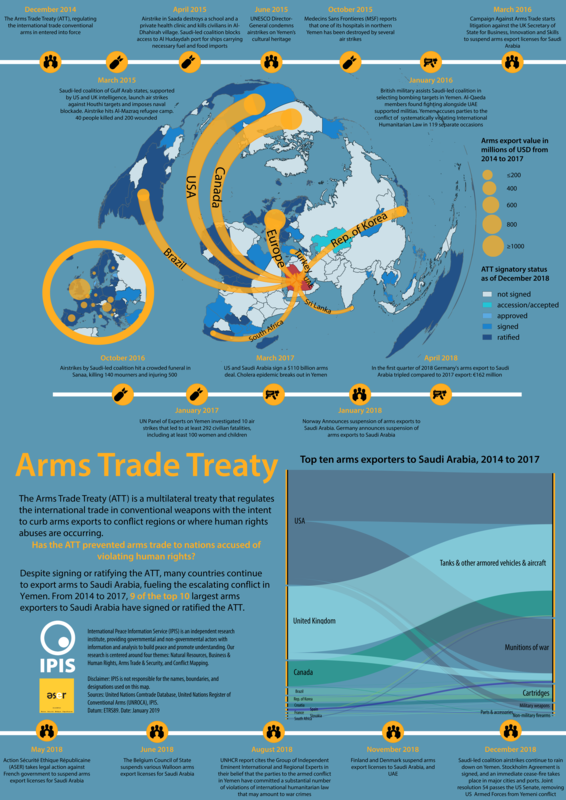 It finds that relying on assurances by Saudi Arabia and Saudi-led review processes is not an adequate way of implementing the obligations for a risk-based assessment set out in the Arms Trade Treaty. It calls on the Government to immediately condemn any further violations of international humanitarian law by the Saudi-led coalition, including the blocking of food and medical supplies, and to be prepared to suspend the licensing of some arms to the Saudi-led coalition. Germany has rejected a plea by the UK foreign secretary, Jeremy Hunt, to resume arms sales to Saudi Arabia, denying that its embargo weakens Europe’s credibility or harms the European defence industry. Belarus’ BelSpetsVneshTechnika (Stand 10-028) has confirmed that its Polonez ground-to-ground missile system is now in quantity production for the Belarusian Army and is already being offered on the export market. European Parliament shocked at the amount of EU-made weapons and ammunition found in the hands of Da’esh in Syria and Iraq. La Suisse n’autorisera pas les exportations d’armes dans des pays en guerre civile. Après des mois de polémiques, le Conseil fédéral a suivi le virage amorcé mercredi dans nos colonnes par le ministre de l’Économie. Sur le départ, Johann Schneider-Ammann nous a confié qu’il allait demander à ses collègues de suspendre la modification de l’ordonnance sur le matériel de guerre lancée en juin. Bulgaria’s booming arms trade continued to grow in 2017 with arms and ammunitions exports topping €1.2 billion ($1.4 billion), an official report showed on Wednesday, October 31, reports The Defense Post. A British defence company has been given the green light to supply an unlimited quantity of goods to China’s military, including airborne radar technology likely to be used by the PLA Air Force. Although the supplier has not been named, the “open individual export licence” (OIEL) has been in place since April – two months after British Prime Minister Theresa May visited Beijing – according to information from Britain’s Department for International Trade. The chairman of a committee scrutinising British arms sales has blamed Iranian-backed rebels for the humanitarian crisis in Yemen, amid an intensifying row over Saudi Arabia’s role in the civil war. The Foreign Affairs Ministry has failed to publish on its website any official statement concerning the murder of journalist Jamal Khashoggi. Human Rights Watch, Amnesty International, and RW UK have received permission to intervene in a court case challenging the United Kingdom’s continued sale of arms to Saudi Arabia. The case will be heard by the Court of Appeal in April 2019. The landmark legal case, brought by Campaign Against Arms Trade (CAAT), seeks to establish that the UK government is breaking its own arms export licensing criteria by continuing to sell weapons to Saudi Arabia, given the clear risk the weapons would be used to commit serious violations of international humanitarian law violations in Yemen. The High Court in London dismissed the case in 2017, but the Campaign Against Arms trade won the right to appeal, and the three groups again received permission to intervene. Investments in arms manufacturing companies by Cambridge colleges total over £6.5m, new data from Freedom of Information requests has shown. Out of the 20 colleges who responded, five were found to hold investments in the arms industry, in corporations including BAE Systems, United Technologies, Airbus SE and Lockheed Martin. An investigation by the Spanish High Court, Audiencia Nacional, into the sale of defense equipment to Saudi Arabia has confirmed the payment of bribes and illegal commissions by the public company Defex in 11 contracts signed between 2005 and 2013 worth a combined €48 million. Les officiels français n’évoquent que rarement les “ventes d’armes”. Ils préfèrent parler “d’exportation de défense” ou “d’exportation de matériels de défense”. Il en va de même de l’ensemble du corpus législatif et réglementaire relatif aux exportations et importations d’armement qui use exclusivement de l’expression “matériels de guerre et matériels assimilés”. European governments and the European Union publicly wring their hands about the “human tragedy” and need for “life-saving assistance” in war-torn Yemen.nYet while the Saudi-led coalition has bombed the region’s poorest country over the past three years, the EU and European countries approved the sale of more than $86.7bn in arms to Saudi Arabia and the United Arab Emirates, according to figures compiled by Middle East Eye. Le dernier rapport de l’Union européenne sur les exportations des armes (qui n’est pas encore publié, mais obtenu par B2) pour l’année 2017 montre comme les années précédentes une position de leader de la France pour les exportations d’armes vers l’Arabie saoudite. Der Rüstungskonzern Rheinmetall will sich mit der Panzerschmiede Krauss-Maffei-Wegmann zusammentun und heizt damit das Fusionsfieber an. Aber ohne die Zustimmung der der Politik geht nichts. Im Fall mutmaßlich illegaler Pistolenlieferungen von Deutschland über die USA nach Kolumbien hat das Landgericht Kiel die Anklage gegen drei Verantwortliche der Firmengruppe Sig Sauer mit Stammsitz in Eckernförde weitgehend zur Hauptverhandlung zugelassen. Saudi Arabia is one of the world’s top customers for international arms companies, even though some of the weapons end up with terrorist groups. DW’s Matthias von Hein asked Andrew Feinstein why that is. In 2014, the international security environment was fundamentally transformed when Russia invaded Ukraine. 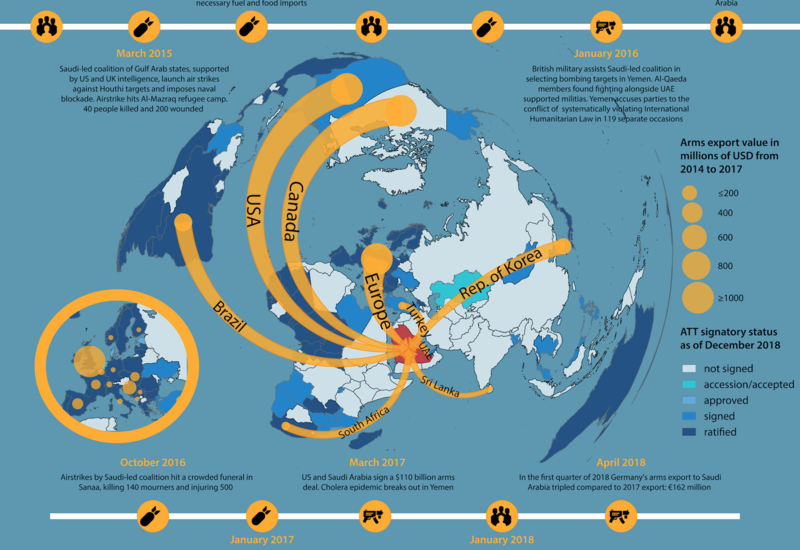 Moscow’s illegal annexation of Crimea and subsequent hybrid warfare in eastern Ukraine shifted defense postures and relationships across the globe. The Ukrainian army passed a test of strength in the face of Russian military aggression. It has restored combat readiness and begun to qualitatively upgrade its capabilities. Le Canada cherche à annuler l’important contrat de vente d’armes à l’Arabie saoudite qui concerne également l’entreprise liégeoise CMI, a indiqué le Premier ministre canadien Justin Trudeau. Saab has received a contract for the Carl-Gustaf M4 multi-role weapon system to an undisclosed customer. Deliveries will take place in 2019-2024. The industry’s nature is such that, due to circumstances concerning the product and customer, further information about the customer will not be announced. l a été convenu mercredi au sein du comité de concertation que le ministre fédéral des Affaires étrangères Didier Reynders (MR) plaiderait au niveau européen pour un embargo sur les ventes d’armes à l’Arabie saoudite, a rapporté le ministre-président flamand Geert Bourgeois (N-VA) devant le parlement flamand. Nearly a third of arms exports authorised by Britain over the past decade were to nations identified by the government as among the worst for human rights, new figures reveal. Military arms deals worth an estimated £39bn were approved between 2008 and 2017, £12bn of which went to states included on the Foreign and Commonwealth Office human rights “priority countries” list, according to analysis by Action on Armed Violence. In September, the defense minister of Spain abruptly canceled the sale of 400 laser-guided bombs to Saudi Arabia. The minister, Margarita Robles, cited concerns that the American-made bombs were likely going to be used against civilians in the ongoing war in Yemen, in violation of both the sale agreement and of Spanish law. Indeed, the same sort of U.S. bomb had been used in August in an airstrike on a school bus that killed dozens of children. Germany’s weapons export policy has become “unpredictable,” to the point where pan-European projects have become difficult to manage or have even been prevented, the head of the German Security and Defense Industry Association (BDSV), Hans Christoph Atzpodien, said in an interview with news agency dpa. Spain is taking part in the modernization of the Venezuelan army’s tanks despite a European Union-imposed embargo on arms sales to that country. The cross-ministry board that controls Spanish military exports approved the sale of €20 million of tank parts to the government of President Nicolás Maduro in the first quarter of 2018. In Algerien werden seit diesem Jahr deutsche Panzer produziert. Ein lukrativer Deal für Rüstungsfirmen. Doch wofür sollen sie eingesetzt werden?